A wise ukulele performer once told me that writing out your list of songs is the smartest thing you”ll ever do for a performance. 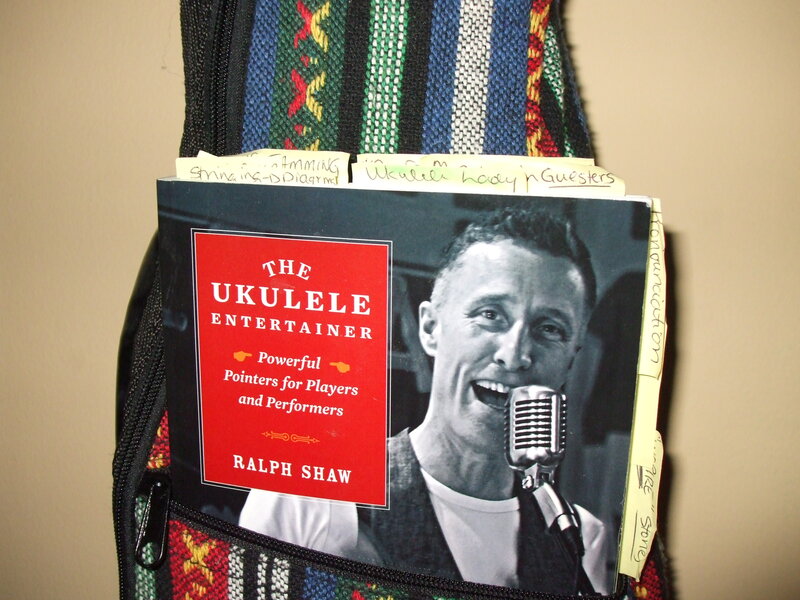 In fact, I bought this person’s book, The Ukulele Entertainer, and it is dog-eared, corner-folded, highlighted, underlined and post-it-ed to the max. It is a well-loved copy! And Ralph Shaw is the author. This book is full of great anecdotes regarding playing, learning, performing and other aspects of the ukulele such as replacing strings and making ukulele wine. A-hem! I’m serious now! I’ve been fortunate enough to meet Ralph twice at festivals and workshops and I keep forgetting to bring my book for him to sign! However, I highly recommend his book because it is literally jam-packed with tons of information, tricks, tips and stories. It even has illustrations! 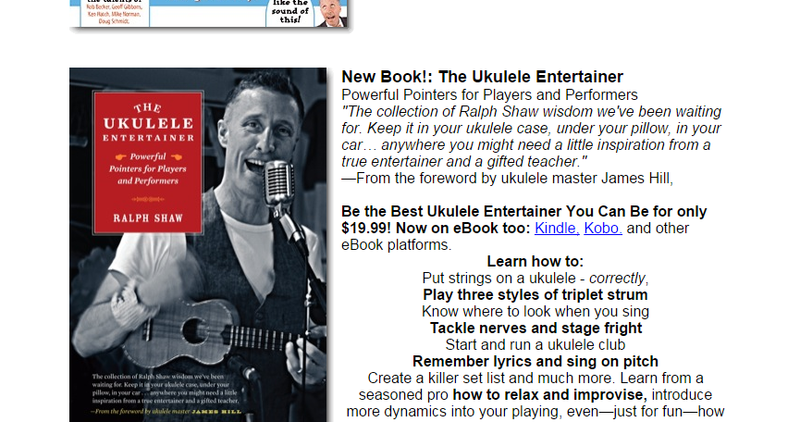 You can order it directly from him, also available in E-book form, here: Ralph Shaw’s website. So one of the reasons I bought it was because it claimed it would show you “How to create a killer set list”. And there is a sort of “belief” that goes along with that idea, where you want to draw your audience in and capture them, then you can do your performance songs, and you can end with a couple of ideas. One idea is to end on a high, with an exciting and happy song, or you can end on a sing-along song that everyone knows, because singing along makes the audience feel good about them selves. For myself, having never busked (and Ralph is a veteran of busking on Granville Island out in BC), I have only used this technique for playing songs at my parent’s house, usually on Labour Day Weekend. They sometimes have a porch full of their cronies after the fireworks, and I entertain them a little bit with just a few songs. A couple I chose because they know every word and I know they enjoy singing along. Others I chose because I know my father will enjoy them and others because I want to show off, just a tiny bit. Those would be the lesser known Hawaiian songs. My “set list” is on post-its stuck to a piece of paper. And I swap them out periodically. It is made up of songs that I have (most of) the words memorized to. Sometimes, I get the order of the verses mixed up, so that is why I have the first lines and then the numbers 2 and 3 circled under the first song on the right, Peaceful Easy Feeling. My father loves The Eagles, so that is for him. I start out with Peace Like A River, and I read the lines for each verse before I start, because I always mix the order up on those, too. And the pattern for the song is underneath that, which I use as an Intro, and after I play the pattern through once, I’ve got it and can concentrate on my singers-along. Five Foot Two, I always have some kind of mental block going on there, where I will be telling myself, “I know it starts on C and then there’s a whole bunch of 7th chords….” and that’s as far as I get. 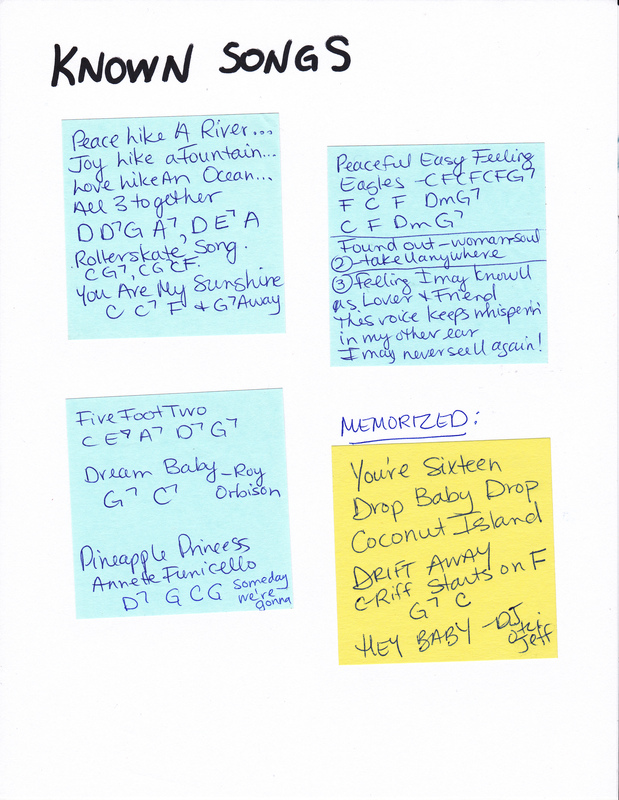 So I write out the chord progression so that I can “hear” it when I give it a once through. I don’t have to worry about getting the words right for this one, generally EVERYBODY knows the words and enjoys singing them out in a raucus manner. Lots of fun. Everyone knows the Rollerskate Song and You Are My Sunshine, most people know Dream Baby and You’re Sixteen. I sprinkle the ones they aren’t going to know in between those: Pineapple Princess, Drop Baby and Coconut Island. I save the best for last with Drift Away and Hey Baby, which my hubby knows by heart and sings in the style of DJ Otzi, very loudly. So there’s my high ending. Today’s song: PEACEFUL EASY FEELING.